Stem. - Acutely angled, rather low. Leaves. - Set close to or clasping the stem, pale, lance-oblong. Flower. - Yellowish-white or straw-color. Perianth. - Narrowly bell-shaped, divided into six distinct sepals. Stamens. - Six. Pistil. - One, with a deeply three-cleft style. In spring this little plant is very abundant in the woods. It bears one or two small lily-like blossoms which droop modestly beneath the curving stems. 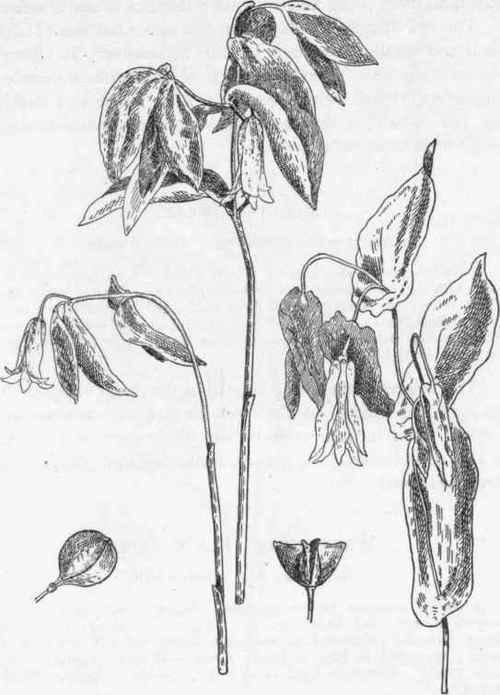 With the same common name and near of kin is Uvularia perfoliata, with leaves which seem pierced by the stem, but otherwise of a strikingly similar aspect.